The morning began with our arrival at the base of the mountain at 6:15 AM. There was a slightly overcast sky with temperatures near 58 degrees. Looking towards the summit, clouds covered the mountain above 5000 feet. The forecast for the finish line from the start was 45 mph winds, 38 degrees with a wind chill of 28 degrees, and less than10 feet of visibility. Something to look forward to. As we pulled into the parking area we were guided by high-spirited volunteers. Cars heading to the top to carry riders down were shuttled to the right, cars not going to the top directed to the left. We headed to the right, parked, and I began the routine of getting myself ready for a “ride event”. I put on my jersey and stuffed the pockets with fuel, and a spare tube. Since I was not racing, but finishing the climb, I chose to take the spare just in case … if I punctured, I could change the tube and finish without a DNF. I readied my helmet, pumped up my tires and put on my cycling shoes. I took a moment to talk with Brydon, who was very nervous about Daddy climbing the mountain, and explain that I would be o.k. This is what I trained for, cycling is what Daddy does, and that I would see him at the finish line safely. We hugged and he said he was o.k. … I’m not sure he believed me. Kathy, Brydon and I then had a family hug, and bid each other safe passage … Kathy was as nervous about driving up the mountain as I was to be riding up. Actually, I was more nervous about Kathy driving up than I was about my ride. Baring unforeseen complications, I knew I would be fine. I walked with my bike across the field, Kathy and Brydon were off to the queue to begin the drive up starting at 6:30 AM … I was alone with my thoughts and headed to the start area. During the wait for the 8:35 AM start I chatted with John Stifler about my expectations for the ride. John is in charge of PR for the climb, and we had been in conversation during the prior week with regards to my climbing the mountain with double knee replacements. John was very experienced with the climb, and has run up Mt. Washington himself. He gave me some pointers about where to expect the most difficult sections, and how others in the past had handled the mountain. The takeaway for me was to stick to my game plan … ride within my own pace, focus on the section I’m riding in at the time, and keep the pedals rolling over. I spoke to a few other veterans of the climb who were only too happy to share their experience with a newcomer. Everyone at the start was gracious… from the staff, to the volunteers and experienced riders. The rest of us were just a nervous bunch of folks milling around before what everyone else knew to be one of the most monumental cycling experiences one might have. Standing at the start and looking up at that shrouded peak, 7.6 miles away and 4500 feet up, was something to experience … even the veterans seemed a little nervous. The first group of “Top Notch” racers went off on time. These were pro racers and experienced amateurs who were expected to make the climb right around the hour mark, or less. The next group to come to the start line was “Senior” racers, ages 20 – 39. “Seniors” based on the USA Cycling racers category, not senior citizens. Following the seniors were the “Veteran” racers, ages 40 – 45. Group 1 was next up, my group, ages 45+ A-L. The final group to leave the line was Group 2, ages 45+ M-Z, Tandem, Unicycle and Junior (under 19 yrs. old). Yes, there were 3 tandem teams, 2 unicycles and several under 19 and a fixie. As I was climbing, nearing the second mile, I had been passed by 3 tandems, 2 unicycles, a young lady of 12 years old and a fixie. I congratulated the young lady on her efforts in amazement as she passed, to find out later she was a veteran. She placed 3rd in the under 19 category at the end of the day, and her Dad won his category and placed overall. I was keeping to my pace, which was looking to be slow, but steady. The grade hits you right away … over 10% over the first mile, and a section of 16-18% in the second mile. After that, it just keeps going up, and up, and up. As I settled into the climb, the group of riders I started out in grew thinner. I became more comfortable as I had room to breath, and could focus on the road ahead of me. Climbing steep grades with other riders surrounding you, passing left and right, and terracing the slope in front of you was a bit unnerving. I soon saw some riders walking their bikes back down the hill. I’m not sure if they were mechanicals or they had had enough of the grade. I passed someone stopped on the climb getting a drink from a water bottle. As they tried to remount, just as I passed, something went wrong as I heard them crashing. We all know that sound, and we want to stop and help. But this time I wasn’t stopping. I was quickly reminded, as my legs were burning, that I needed to focus on the climb. At this point I was trying not to focus on what was around me, but on the road in front of me. I do remember the lush foliage, the early morning smell of wet forest, one of my favorite fragrances, and the water draining off the mountain through the deep trenches that line the road. I had also noticed the organizers had stationed spotters along the course. So far, at every place wide enough for a vehicle to park, was a “radio communications” vehicle with a volunteer shouting encouragement as we pass. The farther I continue the more encouraging the spotters became. Now into the third mile I am terracing the steep sections along with the riders that seem to be riding a pace close to my own. Ironically I am riding along with several people who are walking while pushing their bikes up the road. We are climbing at a similar pace as I crisscross the tarmac. In sections where I can ride a straight line I gain ground on them, but for the most part we stay together over the next mile or so. Here a crazy person riding a fixie up the mountain passes me. The name on his bib is Shamus, and he is wearing a black helmet with a jagged Mohawk that looks like a large radial saw blade centered over his head. We exchange labored greetings and Shamus moves on. In this section I have been passed by several riders, slowly making there way ahead of me. I am encouraged though, as I reach occasional straight sections I can see they are still not far ahead of me. I am not racing, but I’d still like to finish with someone behind me. Approaching miles four and five, by all accounts this may be the most difficult section. By now, my legs want to give up. I had reached the alpine zone where there are no trees to buffer the wind. The road snakes around in every direction, so sometimes you get a head wind, other times a cross wind, and if you are lucky, maybe a tail wind … which when it does occur provides very little aid. This is also where the temperature drop becomes more noticeable. It is twenty or so degrees colder than when I left the start line. The 40+ mph wind is relentless. There is nowhere to hide. On the other hand, the lack of trees allows for the most breathtaking views one can imagine. By now the clouds have lifted to above 6000 feet, just below the summit. The sky was partly cloudy, and the sun lit the surrounding Presidential Range in a warm glow … quite contrary to how I was feeling. There were still the spotters along the course with their cynical comments, “Just one hill to go”, “At the top of the hill you’ll get a little rest”, all in good fun, of course. Everyone knows there is only one hill, which never flattens out.... it’s just up … all up, all the way to the top. Near the mile marker five the hard packed gravel section started. The gravel surface felt a little spongy and not as hard as the tarmac, which incidentally is not at all smooth, but pocked with tread marks from the snow-cats, used to climb the mountain when there is snow on the road. The gravel section is fairly forgiving … except when it rains. I understand that the gravel section is no fun when it is wet and muddy. Fortunately on this day the sun and wind kept the surface dry and agreeable. It would be misleading to claim that I rode the entire distance. Just after the gravel began, the grade kicked up to over 14%, as much as 16%. I decided to dismount and give my quads a break. I walked about a tenth of a mile or two, along with several of the riders that had passed me on the lower slopes, ironically. At a point where the grade eased a bit, maybe 10-12% I remounted. I had trained by remounting on steep sections of Fiddlers Elbow closer to home, anticipating having to stop for fuel, drink and re-mount, as there is no taking your hands off the bars while climbing Mt. Washington. When I was on my way again, I realized I was gaining and passing several of the riders who had passed me earlier. The road had turned to tarmac once again. I was feeling good, and the noise of the summit was coming into range. Cowbells and cheering, the whistle of the Mt. Washington Cog Railway, all sounds that were drawing me near … a mesmerizing effect drawing me in like a black hole. By now the clouds had cleared the summit, although it was still overcast at the finish. Visibility was now hundreds of feet rather than a few feet. I could see the summit building and the coal smoke rising from the cog rail locomotive. I rounded the last big curve in the moonscape all around us, gasping for breath but charging on as I could see the finish line ahead. Just one section of straight, up hill, and the dreaded 22% switchback between myself and crossing the finish line. As I headed towards the final push, all 500+ racers who had finished before me, staff, and the families and friends poised to drive the riders back down the mountain were standing along both side of the final 1000 feet, screaming encouragement and clanging cow bells. I passed two more riders here. I remember seeing flags being waved, a red polka dot flag displayed in particular, and Brydon running towards me, screaming, “Come on Dad, you can do it!” I could hear Kathy yelling for me while trying to video my approach. I remember saying, “hey, little buddy” to Brydon as I cranked the pedals and got out of the saddle. This was the section of the mountain I had feared the most. The section that made me most nervous about climbing … not walking! The adrenaline was really flowing now. This most feared section was actually feeling quite good. There was a man running up the switchback to my right yelling, ”Stay to the outside of the curve! That’s it, outside, outside! !” Brydon running up along my left side saying, ”Come on Dad. You can do it! !” Kathy yelling in the background in a broken scream, “ Go Bubby, go!! You got it! Go!!! Go!!! !” I reached the top, made a quick left and headed for the line. When I crossed the line Brydon was still there running beside me. He had run up the entire 22% section with me and all the way to the line. Kathy arrived screaming. A staff person came over and wrapped me in a blanket they gave all riders who made it to the finish. Which I thought was a brilliantly thought out reception for all finishers … the wind chill was below 30 degrees in sustained winds of 30-40 mph. Everything Mt. Washington is supposed to be … breathtaking!! Kathy, Brydon and I did our customary family hug, and went on to take the obligatory finish line photos. In summary, I finished in 02:47, slower than I had anticipated. With the winds on the upper slopes, I averaged over 3 mph for the climb. 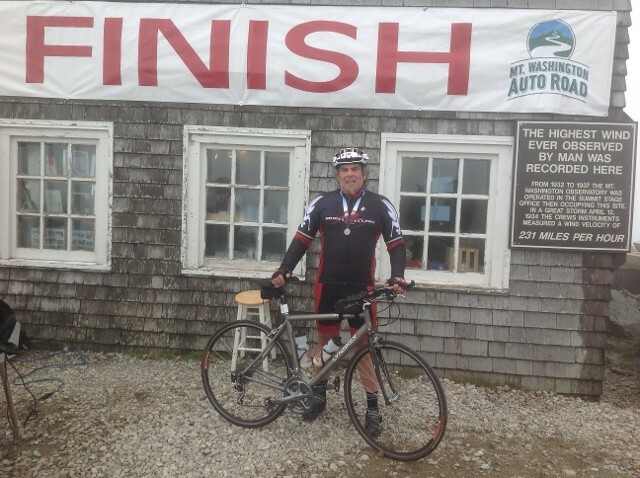 I finished 508th, out of 517 finishers …passing several riders in the last mile of the climb. All in all, it doesn’t matter how many riders finished ahead of me, or behind me for that matter. I finished!!! I became, ”The first person known to have climbed Mt. Washington by bicycle with bi-lateral knee replacements,”. I plan on returning next year to ride through the section were I dismounted. This is one of those rides where once you’ve done it, you want to do it again. It is infectious. It was extremely difficult. It was daunting. It was relentless. Said to be, “the hardest bicycle hill climb in the world.” I agree.